If this newsletter is not displaying correctly, or if you can’t see the pictures, click here to see The ACW Story back issues page. Welcome to the fourth issue of The ACW Story! The theme of this issue is the development and use of submarines during the Civil War. We have an introduction to our main article which gives a history of submarines during the war, and we also have our usual quote and trivia question. New this month will be a suggested reading section with links to books that deal with this topic. Please enjoy this issue of The ACW Story! The disdainful term used in many Northern newspapers when describing rumors of submarines being developed in the Confederacy. We are left to assume that the ones being developed in the North were somehow less "infernal"? 1. A brief history of military submarines before the Civil War. 2. A history of some of the various efforts made to develop effective submarines. 3. We recount several attacks believed to have been carried out with submarines during the war. 4. Finally, there is a brief account of the CSS Hunley and the first sinking of an enemy ship by a submarine. The advances made in submarine technology during the Civil War is truly outstanding, and it all culminated in a successful attack that was not repeated until World War I. What was the first ship ever sunk by an enemy submarine? Hint: Check out this page, to find the answer. Give your answer by replying to the question that is posted on our Facebook page. All correct answers get to give themselves a pat on the back! Civil War Navy is a relatively new magazine, but I think it has a lot potential. It promises to bring to life the underrepresented history of the Civil War navies. 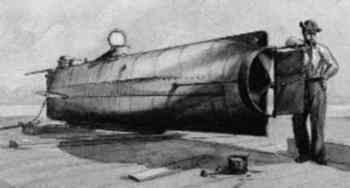 The one issue I have seen was a veritable treasure trove of information about Civil War submarines. It was packed with stories about little known exploits of submarines during the war, and also present day efforts to find and preserve these rare pieces of naval history. Future issues are sure to be filled with fascinating information about ironclads, river warfare, and all things Civil War navy related. Click here for more information! Abraham Lincoln quotes - A collection of quotes from the 16th President of the United States in which he addresses everything from the War to his personal appearance. Boston Corbett - The man who shot and killed John Wilkes Booth against direct orders was not perfectly sane. Read his story here.